Related to peaches and plums, almonds (Prunus dulcis), hardy in U.S. Department of Agriculture plant hardiness zones 7 through 9, are grown not for the green, fleshy fruit or hull but for the seed inside it, which contains the almond nut. The trees resemble peach trees in appearance, growing 10 to 15 feet high and wide with fragrant, showy, pink to white flowers in early spring. It's the earliest-flowering stone fruit, and makes an ornamental flowering tree. 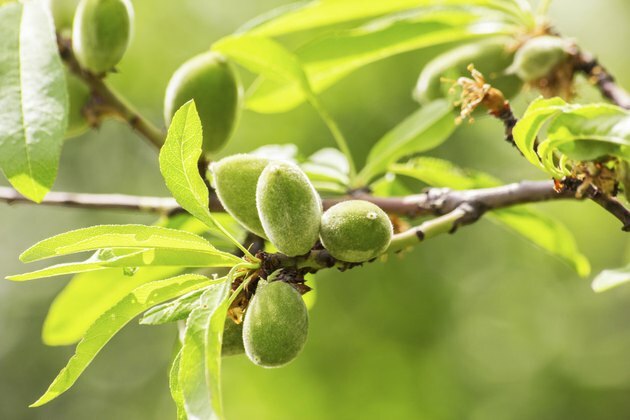 For fruit production, a second almond variety is needed for cross-pollination. Almond trees can provide much delight. Almonds prefer well-drained, deep, loamy soils, but tolerate other soil types, including poor soils, as long as they are not wet or poorly draining. Plant almond trees 16 to 23 feet apart. The trees need ample rainfall or irrigation to produce good yields and well-filled nuts, although they will survive with less moisture. 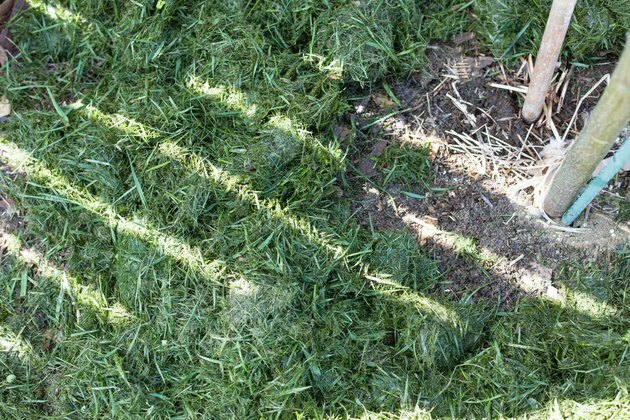 Begin to apply 2 to 3 inches of water every one to three weeks after winter and spring rains stop, starting irrigation after two or three weeks without rain. For trees in shallow or sandy soils, water more frequently. Continue watering through the summer. Plant almonds in full sun. Trees tolerate partial shade but don't flower or fruit as well. Almonds don't do well in areas with high humidity and prefer long summers with hot, dry, sunny weather and therefore a long growing season. You can grow almonds in areas with shorter growing seasons, but you probably won't get a nut crop. Apply a granular 12-12-12 fertilizer at the rate of not more than 1 ounce of actual fertilizer for each year of the tree's age. To calculate this amount, divide 1 ounce by 0.12, which is the percentage of nitrogen in the fertilizer. This equals 8 ounces, or 1 cup of fertilizer. For a one-year-old tree, divide the 8 ounces into three or four applications of about 1/4 cup each, beginning just after the leaves emerge and continuing every four to six weeks until fall, not to exceed the total of 1 cup for the year. For first-year trees, it's better to underfertilize. For a two-year-old tree, apply a yearly total of 2 cups. Scatter the fertilizer under the tree, keeping it 18 inches away from the tree trunk. Mix it into the soil and water it in thoroughly. Don't over-fertilize trees, which could lead to nitrogen burn of the roots and excessive vegetative growth instead of fruit production. 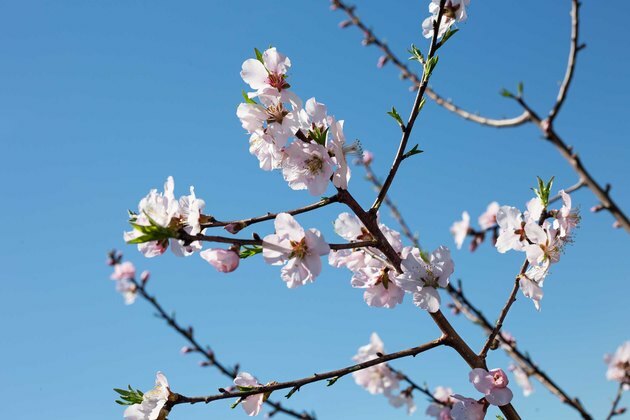 Keep weeds from growing near the almond tree. 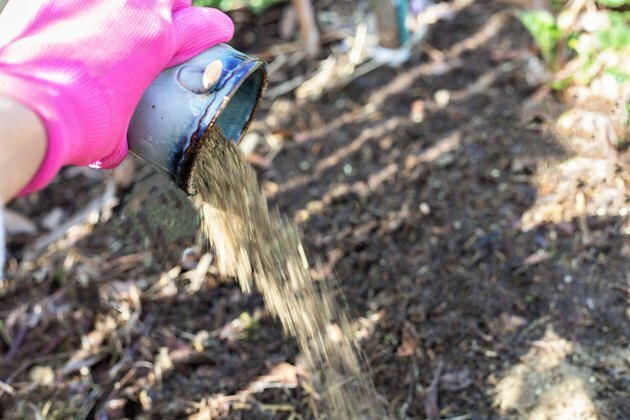 Use mulch to conserve soil moisture and to control weeds, applying about 4 inches of an organic material such as straw or grass clippings. 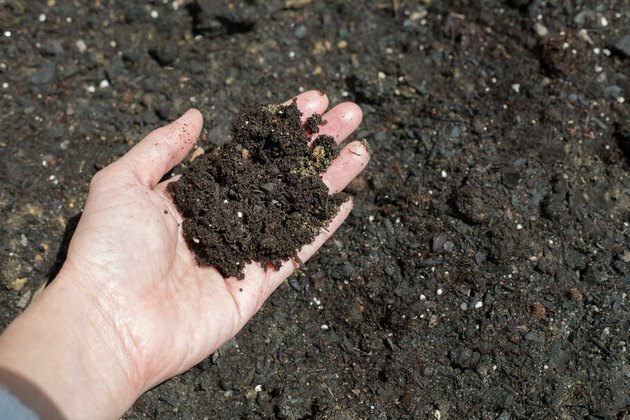 Keep the mulch away from the tree trunk and spread it out past the drip line of the tree.